A multi purpose flour made from soft winter wheat. 2 lb. bag ..
11 oz. ceramic coffee mug with Burnt Cabins Grist Mill logo. Dishwasher & microwave safe. 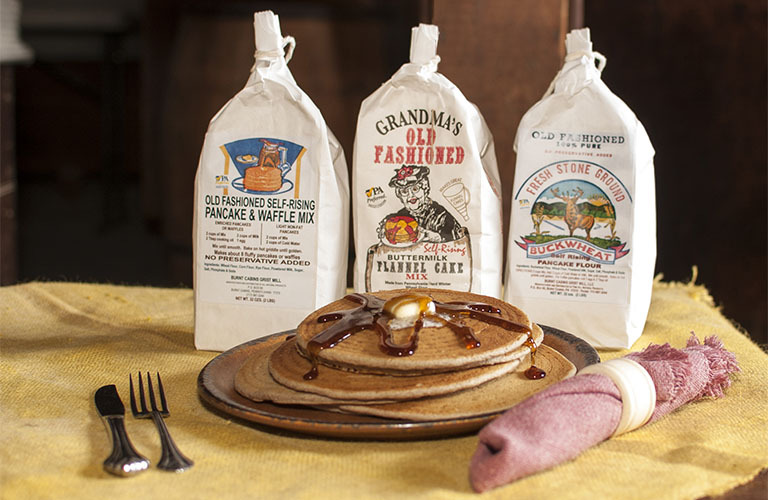 ..
Our own thick & rich pancake & waffle syrup made from corn syrup, water, maple flavor and sy..
100% pure stone ground buckwheat flour. A naturally gluten free product. (Not produced on dedicated ..
100% whole grain stone ground yellow corn meal 2 lb. ..
Hearty tasting 100% whole grain stone ground yellow corn meal. The only difference is the flavor. Th..
An old time favorite with a unique flavor all its own. Old fashioned goodness made from whole ..
A delicious old fashioned flavor. A hearty muffin made from roasted corn meal, wheat flour, powdered..
A light and fluffy favorite, also known as flannelcakes just like Grandma used to make! Versatile mi..
A light corn taste that appeals to the corn lover. A delicious supper pancake made from corn, wheat ..
A hearty blend of three grains sure to please family members from young to old. A great whole grain ..